With the news that Super Aguri is having to decrease its staffing levels as a result of financial difficulties, my attention turns to the plight of the small team in F1. SA are walking a well-worn path in their money problems, repeating the inevitable pattern of restricted budgets preventing success and the lack of success rendering the team unattractive to potential sponsors. It is a downward spiral that is almost impossible to escape, even Minardi finally succumbing after twenty years of constant struggle. What makes Super Aguri different is its supposed status as Honda's 'B' team. The reality is that, if this is Honda's attempt at a 'B' team, it's one done on the cheap. Red Bull take full responsibility for Toro Rosso, supplying it with funds through their advertising sponsorship of its cars; but not so Honda. The rumor that Honda paid for SA to use drivers it was interested in during the recent test in Barcelona, thereby dodging the testing limit, merely emphasizes the fact that Honda want to have their cake and eat it - they'll give money to the struggling team but only if it gives something in return. That is hardly the relationship of an 'A' to a 'B' team. Super Aguri are in the unfortunate position of being labeled as a 'B' team without any of the benefits that should accrue from that. The future looks grim for SA as a result; they have little to look forward to but more financial worries until they sell up to some hopeful concern wanting to enter F1 the easy way. And this is why the current argument regarding customer cars is so important for the future of the sport. Prodrive have already confirmed that they will not be entering F1 in 2008, thanks to the customer car issue not being decided as yet. If the final decision goes against the customer teams, by strict application of the definition SA and STR should not be allowed to compete either. Which would leave only nine teams in the sport and eighteen cars on the grid. It seems a ridiculous situation to have shrinking entry lists when there are potential teams lining up to get involved. Clearly, the problem needs to be addressed quickly and solved in such a way as to encourage the smaller team. And, quite frankly, that means allowing customer cars, whether Sir Frank Williams likes it or not. All of the manufacturers that have the slightest interest in F1 are already involved (with one teetering on the edge of withdrawal as Renault await the results of their "spy" investigation); and only manufacturers can afford to enter the sport as fully fledged constructors, so high are the costs these days. SA, STR and Prodrive have demonstrated the only way remaining for small teams to get started. The suggestion that customer teams be allowed to enter provided they agree to become constructors within a certain number of years is a possible solution. No doubt there are other compromises that could work too but the essential point is that, regardless of how it is achieved, it must be done and soon. Bernie tried hard during the summer to get Spyker, SA and STR to agree to a compromise solution; ultimately, his attempt failed and now all hinges on the result of Spyker's arbitration case, something that should have been done and dusted at the beginning of this season, not the end. After the WMSC hearing, Ron Dennis advised that McLaren would not be appealing against the decision because any further litigation would be bad for the image of the sport. Whether or not you believe that was the real reason, his statement does illustrate a factor that is ignored far too often in the disputes that seem so much a part of F1 in the modern world - that the health and survival of F1 is more important than any single team, that sometimes, for the sake of the sport, it is better to allow the option that is less favorable to oneself. The parties that were too concerned with their own interests to reach a compromise solution when Bernie intervened should be thoroughly ashamed of themselves. They refused to be a part of the solution rather than the problem itself. One of them has already been forced to sell up to a new entrant and thus graphically illustrates how empty was the intransigence that refused to recognize the interests of the sport. The message to those still trying to sort out the mess is clear: one way or another, customer cars must be allowed - reach agreement now or the sport suffers. Super Aguri's situation is sad. As a small team, it should have been supported by the authorities and hasn't (for instance, it technically cannot claim income from F1 until the end of 2008, a restriction that applies to all new teams). As a Honda satellite, it should have been supported by Honda and hasn't (stopping the team from using its choice of front wings isn't a fair thing to do). As a team being sponsored by that company, it should have been supported by SS United and hasn't (the idea of being a sponsor is that you pay for space). And finally, as a member of the F1 fraternity, it should have been supported by the FIA and hasn't (ambiguous rules concerning customer cars have plagued its progress throughout its inception and existence). The customer car situation needed to have been sorted last year, not this. Already we are in a situation where Toro Rosso and (to a lesser extent) Super Aguri have technically breached the regulations in 2006 and 2007. Certainly the 2006 results cannot be appealed. Midland/Spyker/Force India have been attempting to sort the discrepancy out since the beginning of 2006 (the arbitration case Clive refers to is only the latest in a series of attempts to get the rules sorted out). The simple reason is because if customer cars are allowed, it will eventually kill off all small teams. By allowing customer cars, the constructor teams will end up fighting for customer teams. Inevitably only one of these can win, which means only a small number of constructors can exist (probably two or three). These teams will then effectively control the fate of all other teams, turning them into constructors' "B" and "C" teams. They would have to give up political and technical control, and effectively be forbidden an existence independent from the "parent" team. Also, the cars would be even more similar to each other than they are now, which surely is against F1's best interests in terms of competition. That's why Force India are having to go through arbitration - it's not just a question of their own survival (having been taken over twice since this issue arose, it would probably have been in their own self-interest to just sit there and smile) or even that of teams like it, but for the interest of all the teams, including the ones that are arguing against it. It's a really vexed situation, but if the FIA had made its mind up what it wanted and written the rules accordingly, most of this would have been avoided. All true, Alianora, but with a little more flexibility compromise would have been agreed by now. I have heard some workable suggestions that have been rejected and it seemed at one point that Bernie had achieved success in his talks with the teams, only for it all to fall apart again because one team decided to raise another microscopic point. As the parties most immediately affected by the problem, they should be showing the FIA the way forward, since that body seems incapable of coming up with a solution. Alianora raises an interesting point: if it is legal to purchase your chassis from a different company, it is likely that all teams will want to purchase the chassis that wins. I wonder what the real limit of "a chassis of your own design" is, however; while Toro and Aguri run other teams' last year's cars, I would like to think that the teams occasionally come up with different wings or other parts through experimentation instead of staying with the chassis -exactly- as it was. When you are attaching all these different things to the cars, when do they become different cars? I remember the commentary on Speed (Daid Matchett probably) joking, does it become a car of your own design by swapping metric measured bolts for imperial ones? Not that any of them are likely to stay in F1 given the imbalances between the budget necessary to be competitive, the budgets the top teams have and the budget a non-manufacturer/corporate team can hope to raise - but then that's been the case for donkey's years, and nobody seems too interested in dealing with it. That is one problem that neither the provision nor prevention of customer cars will solve. Sorry if I seem a bit grumpy today. My understanding of it is that the rules say that each team must own the intellectual property(IP) for its own car and no piece of intellectual property may be owned by more than one team. This is the loophole that allowed Honda to sell its 2006 intellectual property to Super Aguri. So no matter what changes you make to a car if any piece is common to two teams one or both of them is in breach of the rules because no two teams can own the same IP. The Red Bull / Toro Rosso situation this year is problematic because they both own the rights to the same IP for the majority of the car although the IP is held by a Red Bull company that is 'entirely' unconnected with either team. I didn't know Honda had run last year's car. I assumed that the only reason they didn't ditch the 2007 car completely by May was because SA were running the 2006 car and they wanted to avoid an controversy. Last week in test SA ran the 2007 Honda to evaluate drivers for Honda but without Honda incurring test mileage. That has to be stamped on. 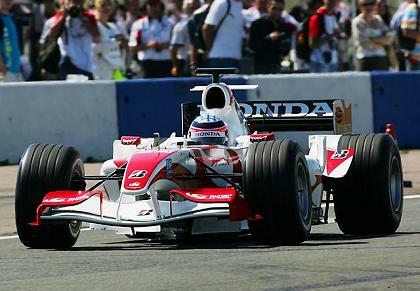 I think it was at the British GP that Honda ran the old car rather than the new, probably to give Jenson an outside chance at his home race. Very little was said about it at the time; although I wondered about the legalities involved, I wasn't certain that Honda were using the "sold IP" excuse to allow SA to run their car and so didn't write about it. "a chassis of your own design" ..... hmmmmm? doesn't that exclude BUYING your chassis, even buying last years chassis as it is not "your own design"
"if any piece is common to two teams one or both of them is in breach of the rules because no two teams can own the same IP." But most all the cars are currently using the same braking system. Who owns the IP for the brakes? And now they're set up to share common ECUs. Who owns the IP for the ECU? Aren't we already infringing some rules? I'm sure you get the picture. The business of changing metric hardware for Imperial may be farcical but what is necessary to differieniate between designs, can I magnify the blueprint by 5% or change the shape of the fuel tank? OWNING the IP?........ could a "B" team PAY the "A" team for the IP? "A" developed it and uses it but sells the design so that BOTH 'own' the same IP? Or ...... PAY "A" to develope a chassis for "B". Don't we already have a similar situation with shared engines? I see 35 new pages in the FIA regs when this is over.